Walk through Melbourne’s seaside village of Williamstown and you’ll be struck by the beautiful tree-lined streets and original homes. Perched on a corner, half way between the bay and the esplanade, is an expansive new double fronted family home in classic Williamstown style. Designing a new build in a heritage area is no easy feat, but it’s a challenge Tina from Tina Lindner Building Design had plenty of experience with. The mix of beachy charm and heritage style were aspects that the homeowners had recognised in Tina’s other projects before they approached her. “We loved the houses Tina had designed in the area,” says owner Ben. The successful project resulted in winning the Residential Heritage Design award in the BDAV’s 2017 Building Design Awards, as well as commendations for Residential Design – New Houses $500K-$1M, and Residential Interior Design. The exterior provides a nod to the neighbouring Victorian houses while shying away from heritage reproduction. The front of the house is dominated by two structural box windows on either side of the entrance. The stone, white and timber façade appears timeless. Upon stepping inside you are struck by a thoroughly sophisticated modern home. Tina says that the main challenge she faced when designing this project was to make a modern new build feel responsive to a street lined with heritage homes. “The focus of the design was finding ways to work with the existing houses. To create a modern but sympathetic exterior and a single-storey façade”. With polished concrete floors throughout, the design features clean lines and high-end finishes that lend elegance. to the home. The living room and kitchen form the heart of the ground floor with floor-to-ceiling battens providing a divider between the two spaces. The corner-stone of the living room is an inviting fireplace with stone hearth as well as a day bed overlooking the front landscaping. The kitchen incorporates a concealed pantry and study-nook area. The custom joinery cupboards run the full height of the room. In the centre of the kitchen sits a communal marble island bench generously proportioned for family functions. The master bedroom on the first floor has timber molding and flows through to a generous dressing room, ensuite and private sitting room. The dark colour scheme that runs throughout the levels adds a touch of sophistication to this parents’ retreat. The dressing room features custom joinery and provides ample storage. The focal point of the ensuite is a striking mosaic floor and full-length double vanity. 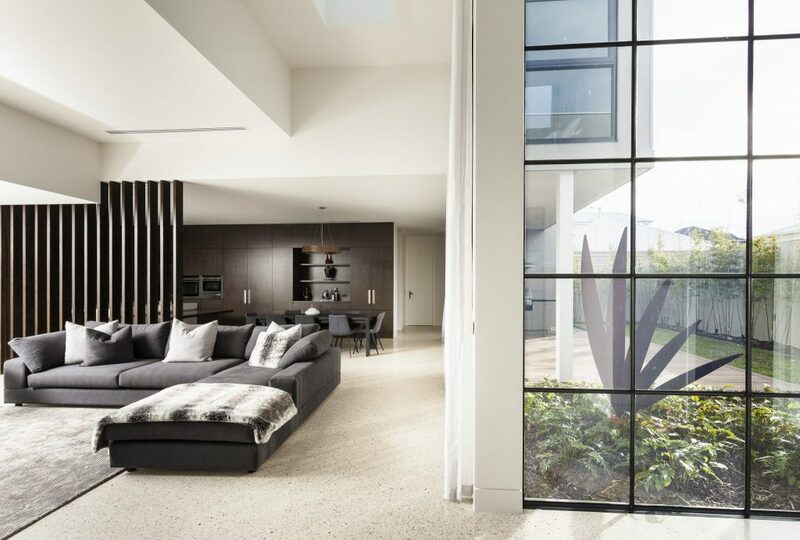 A key feature of the ground floor are the striking floor-to-ceiling steel windows that add a modern city feel to the beach-side home. The windows flood the floor with an abundance of natural light while providing views to the private courtyard and landscaped areas. This is the homeowners’ favourite part of the design. “It’s lovely and light and opens up the whole house,” says owner, Ben. “And the open plan creates a great space where the family can come together at the end of the day”. The Judges said this was an impressive building illustrating how a new design can be sympathetic to its heritage context, whilst displaying a well-articulated and considered form. They also agreed the interiors cleverly reference the traditional, with mouldings creating a moody, elegant bedroom. The depth of tone contrasts purposefully against the light-filled living rooms, offering a variation in atmosphere to the various spaces. Each space has been designed to ensure the level of intimacy is appropriate for its function; from the bright, open living rooms to the moody and inviting bedrooms.